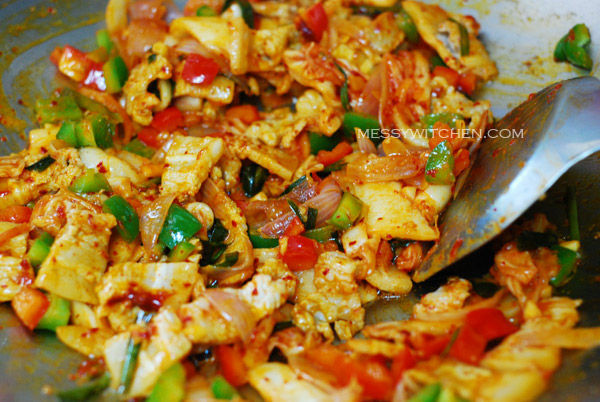 Come follow me and let me show you how to cook kimchi fried rice. First, fry egg sunny side up in a wok. Set aside. Slice pork belly according to the thickness you prefer. 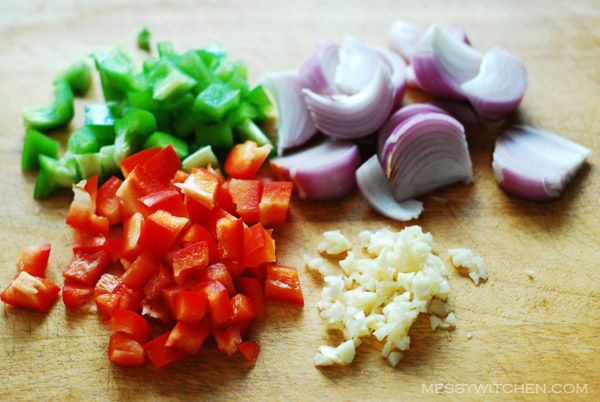 Prepare ingredients as shown (clockwise from top right): Sliced onions, chopped garlic, diced red and green capsicum. 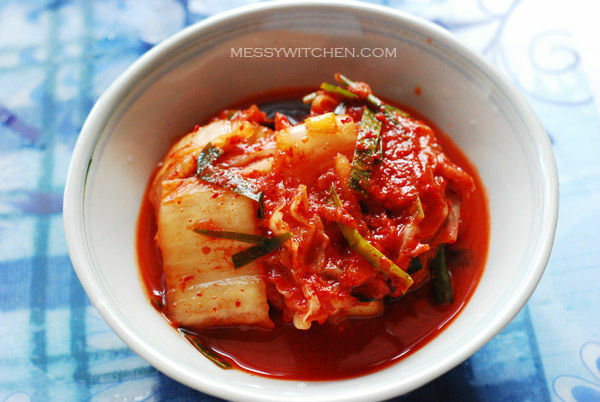 1 cup of ripe kimchi with juice. 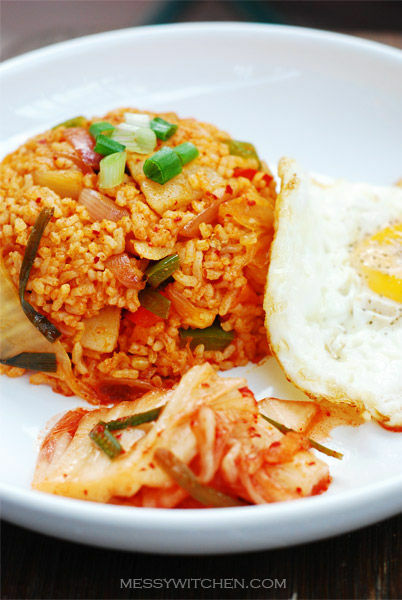 Note: Use overnight cold rice and ripe kimchi for best kimchi fried rice flavor. In a wok, add 2 tablespoons oil. Saute onion until translucent. Add garlic and pork belly and cook thoroughly. Add red and green capsicum. Cook for about 1-2 minutes. Next, add gochujang and kimchi. Lastly add rice, soy sauce and kimchi juice. Mix well. Then add sesame oil and freshly grated black pepper. 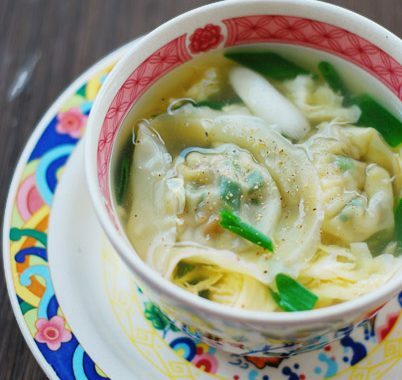 Serve warm with fried egg and spring onions. 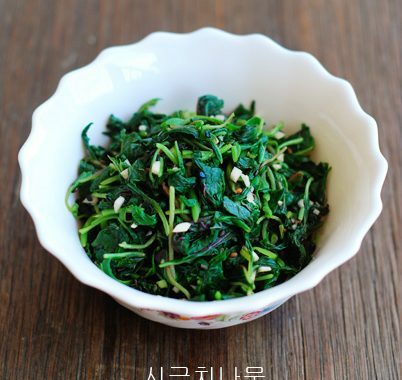 You can also add sesame seed and nori on the fried rice. 1. 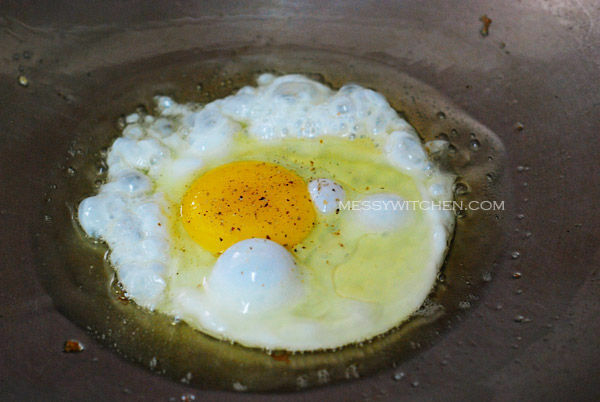 Fry eggs sunny side up in a wok with 1 tablespoon cooking oil. Set aside. 3. Add garlic and pork belly and cook thoroughly. 4. 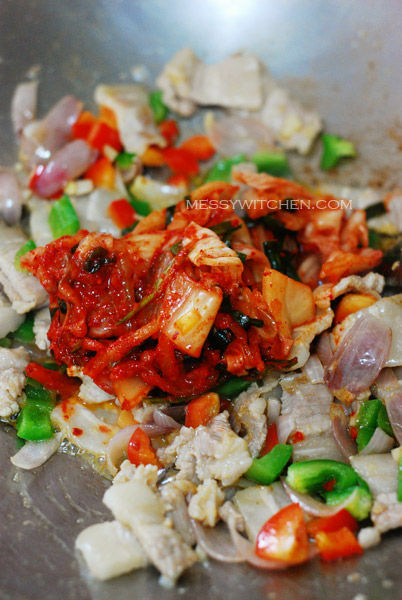 Once pork is cooked, add red and green capsicum. Cook for 1-2 minutes. 5. 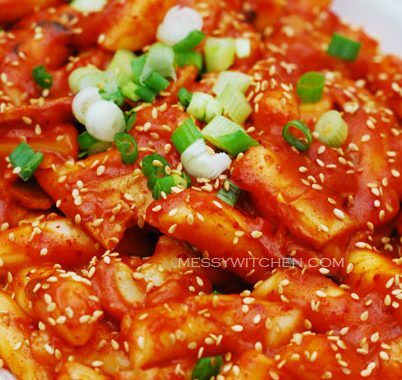 Add gochujang and kimchi. Stir-fry for a minute. 6. Add rice, soy sauce and kimchi juice. Stir to combine well. 7. Lastly add sesame oil and freshly grated black pepper. Dish up and serve immediately with fried egg and spring onions. Such a great recipe. I prepared it and folks thought it was from a restaurant. I used fresh kimchi rather than jarred or canned. I think this made the difference. Hi JB, for great kimchi taste… ripe (old kimchi) is preferable. 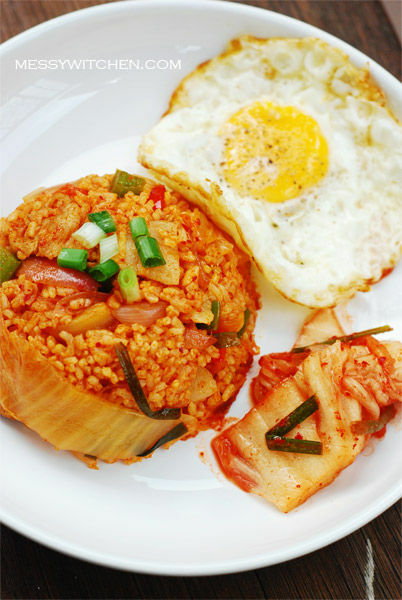 However I’m glad you like the fried rice taste with fresh kimchi.